Super 8 premier league round 29 preview – Kenyatta University TV (KUTV). All Rights Reserved. Relegation battle, who will survive? With the Super 8 Premier League title done and dusted, focus now shifts to the bottom of the log where doomsday is fast approaching for several teams fighting to avoid relegation. As the league enters the penultimate round this weekend of October 13-14, the main source of excitement will be the scrap to beat the drop which is shaping up to be a nerve-juggling affair. The desperate fight looks to go down to the final league match of the season with teams hovering on the bottom half of the 16-team log are nervously looking over their shoulders. However as of now, impending calamity looms large for 4 relegation candidates; RYSA (31), Leads United (30), Shauri Moyo Blue Stars (29) and Kayole Asubuhi (26). The bottom four desperately need to win their respective fixtures this weekend and hope other results go in their favor to keep alive slim hopes of avoiding the drop. Runda Sports Association (RYSA) late bid for survival will come under stiff test when they play fellow strugglers Shauri Moyo Blue Stars away at Ziwani grounds in a colorful fixture bearing signs of an electrifying duel. Both sides are in a must-win situation with RYSA needing to win while hope 11th place Rongai All Stars (31) lose to Makadara Junior League SA to keep the slim interest of playing in the Super 8 top flight. RYSA placed 12th have won two of their last three games and their latest 1-0 win over Meltah Kabiria 1-0 gives the debutants major boost in confidence of avoiding a return to the Super 8 Div One League. “We are not denying the pressure is there but we have handled the same pressure throughout the season. It will be a tough game but from the preparation we’ve had, I know we can win this game. I am positive we can survive we have to keep the fighting spirit until the end.” Eliud Mathu, RYSA coach said. Having suffered a 1-0 defeat to Metro Sports, Blue Stars who have played in the competition for three consecutive seasons will need a win while they cross fingers MASA (29) and Metro Sports (31) lose to Shauri Moyo Sportiff and Meltha Kabiria respectively. “It just like any other game but of course the stake is high and for us, we are targeting a win and hope it things go as planned.” Shauri Moyo Blue Stars’ coach Hassan Ali said. Bottom-placed Kayole Asubuhi have a date with destiny as they host freshly-minted champions Jericho All-Stars at Calvary grounds in perhaps the most significant match of their season. Any result apart from a win will confirm the worst the 2016 champions; relegation. A torrid campaign culminating in 6 wins and 8 draws in 28 attempts has the Isaiah Omondi charges surfing between the perilous lines of relegation. 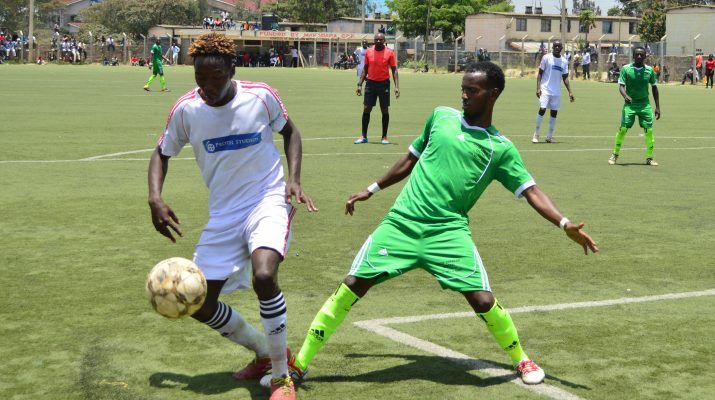 The leaky defense has been the main undoing for Leads United who clashes with deposed champions Kawangware United at Riruta BP stadium looking for a win to ease their relegation concerns. Leads have conceded the most goals in the competition, 49 so far and they need to shore up their rear line and post impressive results against Kawangware to climb off the danger zone.